﻿ VIDEO: SECORE's 2014 Coral Spawning Season Is Here! 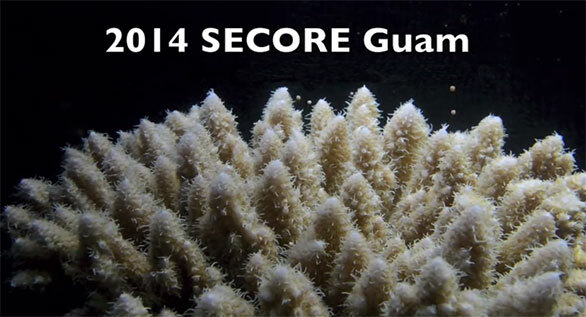 VIDEO: SECORE’s 2014 Coral Spawning Season Is Here! Readers of CORAL Magazine should already be familiar with the long running SECORE Foundation, which continually pushes the boundaries of sexual coral reproduction research. The findings from SECORE (SExual COral REproduction) could have profound implications for both coral reef conservation and restoration efforts for decades to come, but spillover understanding may no doubt change the face of coral aquaculture for the aquarium trade as well. SECORE’s annual coral reproduction workshops are spreading out from the Caribbean. This year’s workshop season started off last week in Guam, to be followed by workshops at the Riviera Maya in Mexico, and Curacao in the Southern Caribbean. We’re going to share three of the latest videos to come out of the Guam workshop – if they inspire you, follow SECORE on Facebook for countless real time updates with additional photos and commentary as it happens on the ground! One quick note – your audio settings are fine; it appears that all of these videos are silent (no audio component at this time). Watch as participants are led by Dr. Laurie Raymundo and Dave Burdick on a snorkle trip through Guam’s Tumon Bay, which has been hit by bleaching events in 2013 and now again in 2014. Watch a time-lapse video of the team constructing the larval rearing system at the University of Guam’s Marine Lab. This video shows the real time laboratory spawning of an Acropora surculosa colony, which started at 8:00 pm, July 20th, 2014, and was completed only two hours later.